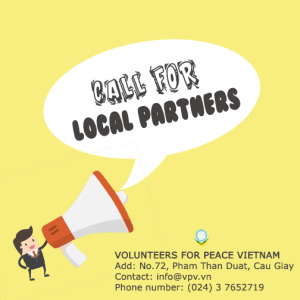 Volunteers for Peace Vietnam (VPV) is looking for one program intern for the period from June 2018 to November 2018. - The internship will begin on June 1st, 2018 and end on November 30th, 2018. - The intern is committing to a minimum of 20 hours per week. Due to work requirement, the intern sometimes may need to work in the evening or on the weekend. 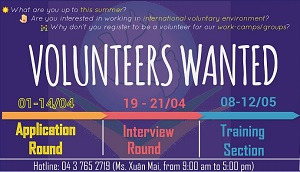 The intern should let VPV know as far in advance as possible on details of the planned vacation days and time off. - The intern should inform VPV at least one month in advance of any early ending of the internship due to personal reasons. 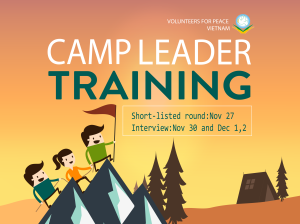 Place of internship: The intern will primarily work at VPV office in Hanoi. Depending on assigned tasks, the intern may work at different locations for short periods of time. * And other relevant tasks based on mutual agreement of both parties. - This is an unpaid internship. The intern is not entitled to wages or other compensation other than the experience and learning for the time spent as an intern at VPV. 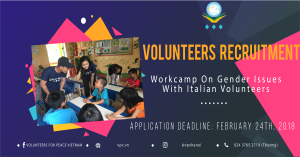 and relevant training and mentoring to gain valuable experience for future job selection, application, and performance in the field of international voluntary service. 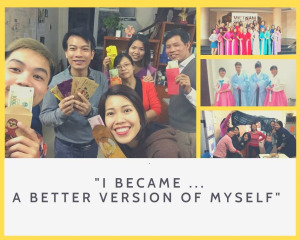 Besides the above criteria, we also appreciate candidates with experiences in working with foreigners or capacity to speak another foreign language like French, Japanese and Korean.